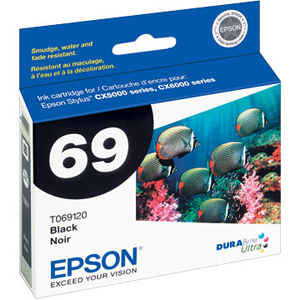 Genuine Epson T069120 Black Ink Cartridge for Epson Stylus CX5000/ CX6000 printer. 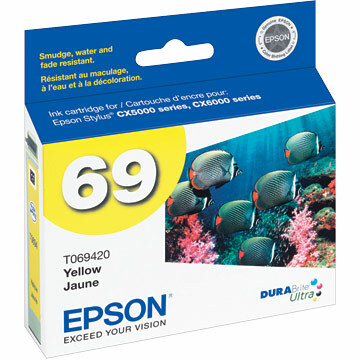 Genuine Epson T069220 Cyan Ink Cartridge for Epson Stylus CX5000/ CX6000 printer. 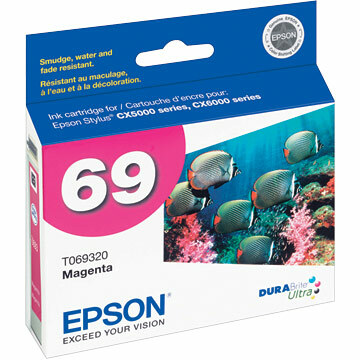 Genuine Epson T069320 Magenta Ink Cartridge for Epson Stylus CX5000/ CX6000 printer. Genuine Epson T069420 Yellow Ink Cartridge for Epson Stylus CX5000/ CX6000 printer. Epson T069120 Premium Quality Remanufactured Black Inkjet Cartridge designed to work in the Stylus CX5000/ CX6000/ CX7000F/ CX8400/ CX9400F printers. The use of Remanufactured supplies does not void your printer warranty. Epson T069220 Premium Quality Remanufactured Cyan Inkjet Cartridge designed to work in the Stylus CX5000/ CX6000/ CX7000F/ CX8400/ CX9400F printers. The use of Remanufactured supplies does not void your printer warranty.